2 cylinder Briggs & Stratton 24 HP Intek V-Twin engine provides longer life. Fender mounted cutting height adjustment, adjustable seat and ergonomic steering wheel. Auto transmission for smooth, variable forward and reverse speed. Air induction mowing technology improves airflow within the deck, ensuring a clean, consistent cut every time. Speed and direction are managed by pedals, which lets you keep both hands on the steering wheel, for optimum driving control. 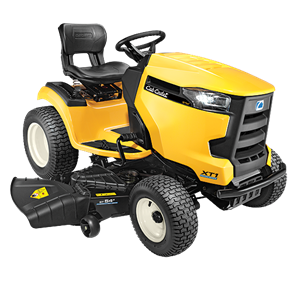 Convenient cruise control function that ensures the tractor keeps an even speed, even if the lawn is undulating or sloping. Step thru for easy mounting and dismounting. 15" high back adjustable seats for greater comfort. 48" cutting width. 6 cutting height adjustments. New FastAttach™ blade system for easy blade changes. Click here to learn more.